Although you’d hardly know it based on Sydney weather, spring is actually here, and with it comes the opportunity to bring the outside in, have friends over and host more dinner parties (because Lord knows during winter I barely saw the outside world!). Here are three gorgeous table setting ideas and how to make them work at home. Let’s get styling! I love this table setting idea because it feels rich and romantic. To achieve this look, it’s all about layering. Notice the two table cloths in contrasting material but in similar pattern? This creates textural depth and makes the fabrics the star of the setting. A simplistic table runner and napkins – in colours pulled from the surrounds – really ground this look. Metallic cake stands and glassware with curved lines give this setting a sense of soft femininity. Be careful: The tall branches in a glass jar is a definite wow-moment, but you’d best have this one in the centre of a long table where it won’t obstruct anyone’s view. Don’t place guests directly either side of it. If the table is small, consider moving this vase to a buffet when you’re eating. Related Read: How to make your flowers last longer. If you have dinnerware, crockery and cutlery that you want to be the show-stopper of your setting, a look like the one above is a good choice. 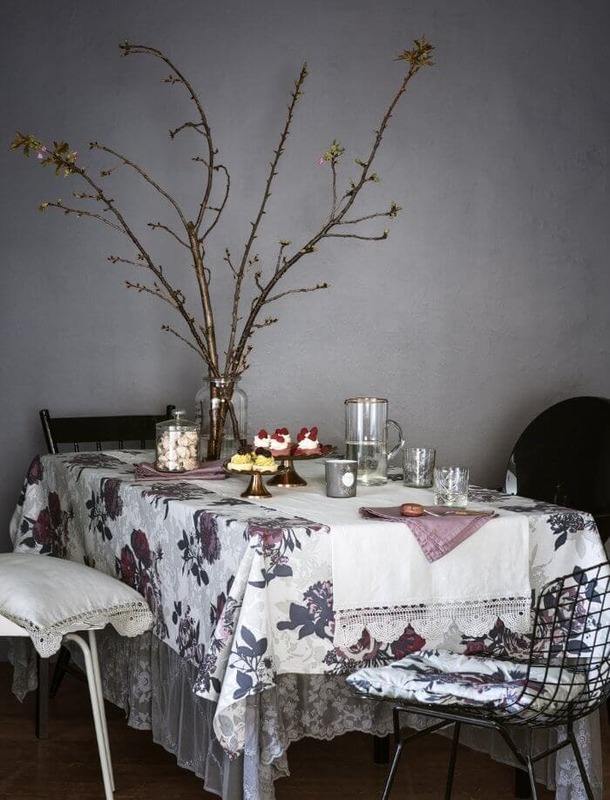 The tablecloth and accompanying fabrics have been kept in solid colours, allowing patterns in the pieces on top of the table to grab your eye. There’s a definite visual story running down the centre of this table – and using your food and jars to create this is a nifty idea. Notice the varying heights of the pieces, too; this creates interest and takes the eye on a journey. Be Careful: Be mindful not to overload the table or guest will feel cramped. If your going to mix patterns, keep them in the same colourway and ground the look with some block colours underneath. Choose flowers in a similar colour theme to the setting but with one accent, like the orange pop above. A spring table setting needn’t be brimming with decorative pieces. Sometimes it’s a case of the simpler, the better. To create a clean and minimal look like the one above, choose one shape and repeat it in a few varying materials. Above, circle shapes are repeated in glass and metallic (repetition always creates calm). Keep the colours fairly neutral and choose one accent in a powdery or chalky hue. Candles will help liven the look and just a few flowers in the same colour will soften the setting. Be Careful: Too many shiny finishes can make any space feel cold and clinical. If this is happening in your setting, bring in warmer textures like blonde timber bowls or platters, or a vase with a matte paint finish. This will keep the scene from feeling sterile. Related Read: Spring Cleaning made easy with these expert tips! Images in this post come courtesy of H&M. 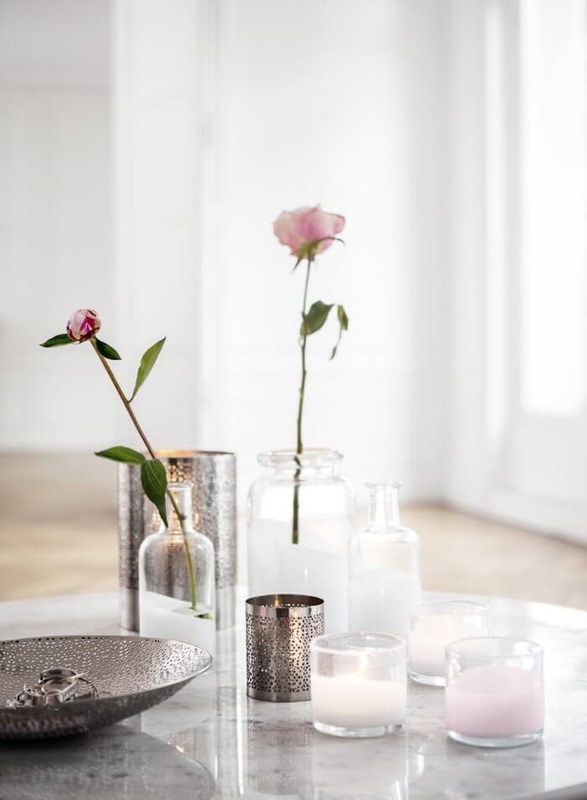 I adore the light minimalist look with table dressing styles although it can be so easy to get carried away and over style.